Posted December 29, 2016 by Kevin. Adventure to begin in 3…,2…,…But first… take notes! The 2016 Rickshaw Challenge has finally kicked off, and each team is just about ready to begin the ultimate Indian adventure race. All 20 teams of the 2016 Rickshaw Challenge have arrived, and today marks the first day they will get behind the wheel. Although none of the teams will actually depart Chennai (unless looking for an unsportsmanlike head start) they will all get a feel for what the ultimate Indian adventure race will entail. The first day of the Rickshaw challenge is simply a practice day to learn more about navigating though India, and hopefully get to know each other! This year’s race is a truly international one, with members of 11 different countries taking part. Many of these team members have already checked in via Facebook. 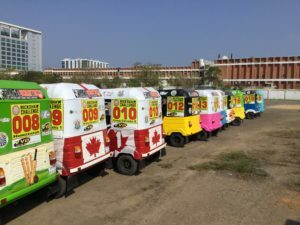 Johanna Budde-Laakso of the Rusty Couple team helped break the ice by asking some of the other teammates where they’re from, while Rachel Lowery of team The Magic Bird opted to take a nap upon arrival in Chennai. The first day of the ultimate Indian adventure seemed a difficult one for Alan of team King Tuks Wah Wah Tuk, who let it be known he will not be following his wife’s directions for the remainder of the rally. Tomorrow will be the first true day of the Indian RickShaw Challenge. Each team will need to navigate their rickshaws from the beautiful coastal city of Chennai to the formally French-colonized city of Pondicherry, nearly 146 km away. It is sure to be an exciting rally this year. Only time will tell how the ultimate Indian adventure will play out for these intrepid travelers, but if the past is any indication, it will be an experience of a lifetime.